Forestry touches on all aspects of human welfare in one way or another, which is why foresters need to play an active role in determining our collective agenda. From pulping in Sweden and Brazil, paper mills in Greece and India, agroforestry in the Philippines, “pink” disease in India, and oil bearing trees of Vietnam, no topic is off limits. 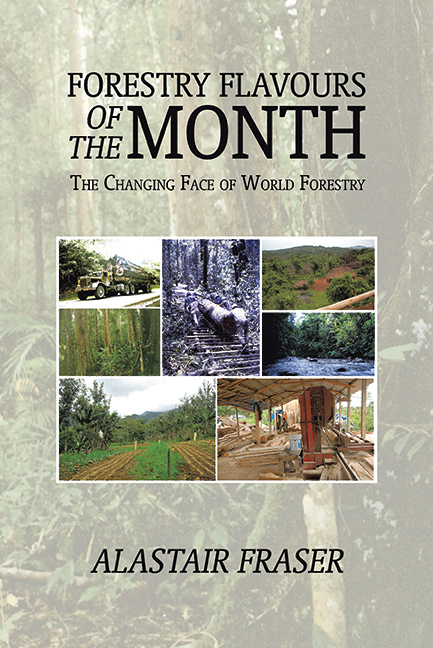 Based on the author’s life as a forester in dozens of countries, this account shows the breadth of forestry and makes a convincing case that forestry management needs to focus on managing change and achieving sustainability. Whether you’re preparing to become a forester, already in the field, or involved with conservation, the environment, or government, you’ll be driven to action with Forestry Flavours of the Month. Copyright © 2016. Alastair Fraser. All rights reserved.